Fabric Mart Fabricistas: Made by a Fabricista: Geometric Floral Double Knit Winter Dress (Butterick 6525). 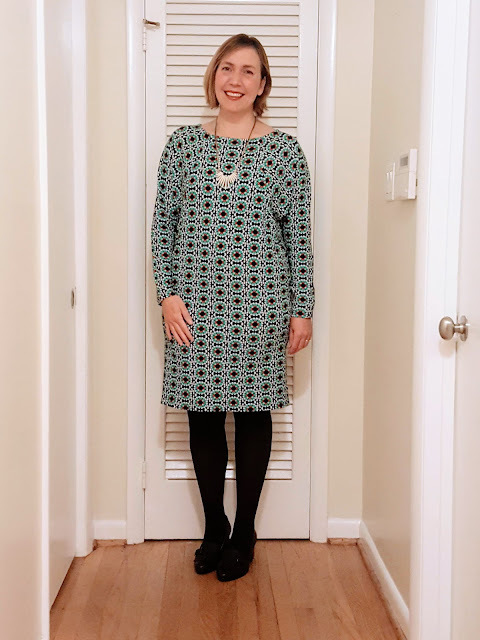 Made by a Fabricista: Geometric Floral Double Knit Winter Dress (Butterick 6525). Happy November...and happy colder weather. I dislike colder weather, so I am not exactly loving the weather right now (especially since it just snowed in November in Virginia--which is highly unusual). But I do LOVE long sleeved jersey dresses, so I can at least dress like I am okay with the weather. I have a very strong fondness for double knit fabrics. They are warmer, they are thick, they are stretchy, they lay flat instead of curling up at the edges the way single jerseys do, and they are fairly easy to sew, even on a traditional sewing machine. I was thinking about it, and I decided that if they invented linen double knit fabric, I would be in heaven (if this actually exists, please let me know!). Most often, double knits come in a poly blend, and though polyester is not my favorite, they do travel well (no wrinkles) and they are durable. They also hold color really well, so if you enjoy bright patterns, these are perfect for you. 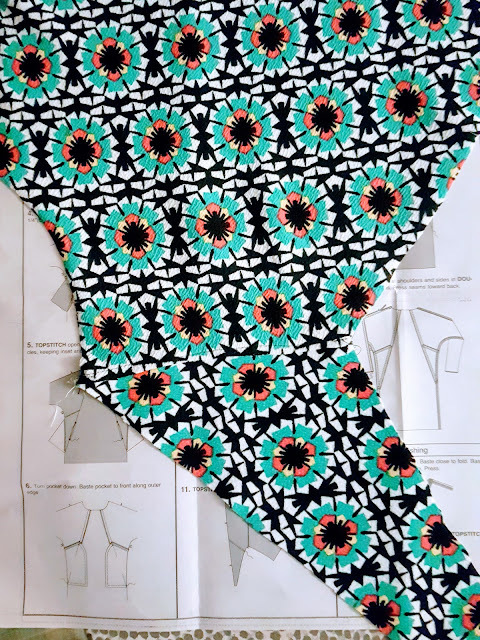 I ended up deciding that for my November make I would try using this bold floral in a geometric design. The minty blue mixed with black, white, fuchsia, and yellow was appealing. (This color is sold out, but they do still have the orange version.) I do like Boden's bright and unique designs, so this clearly isn't a stretch for my taste. 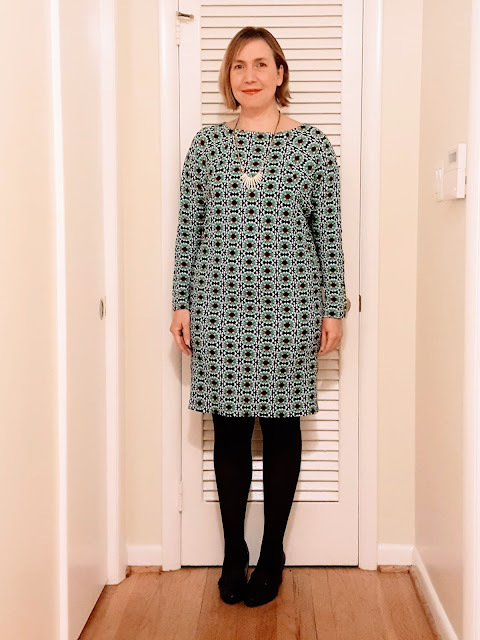 The original intent was to make a dress/tunic from Ottobre, but the lines from the pattern sheet and tracing I would have to do seemed a bit overwhelming for this eighth grade teacher with high school recommendations, placement tests, grading, etc., on her plate. So I will save Ottobre tracing for Christmas vacation and make it then with another fabulous fabric. 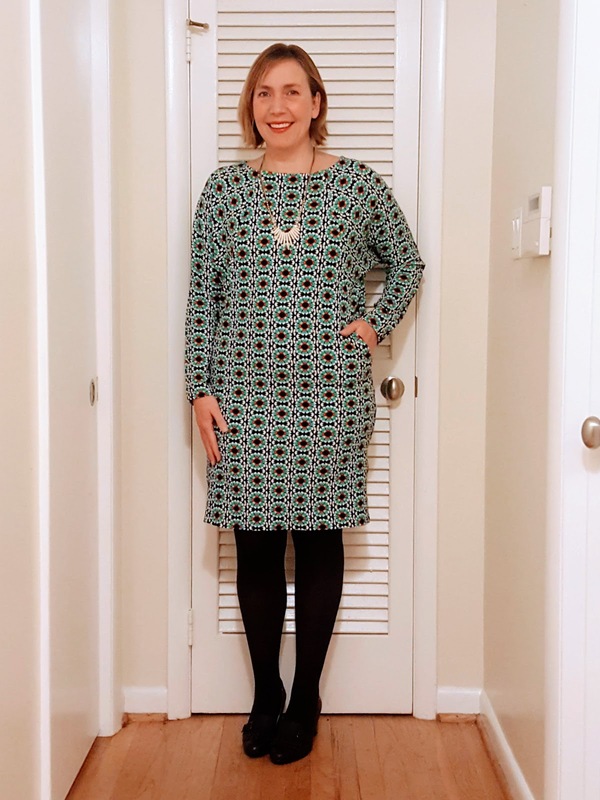 In the end I went to Joann's, saw that Butterick was on sale, and bought this pocketed dolman sleeved dress instead. 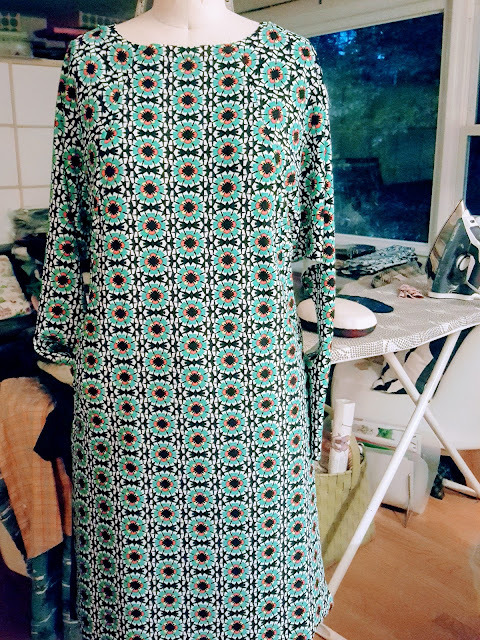 It was an easy enough looking pattern, and I figured it would look really cool in this fabric. 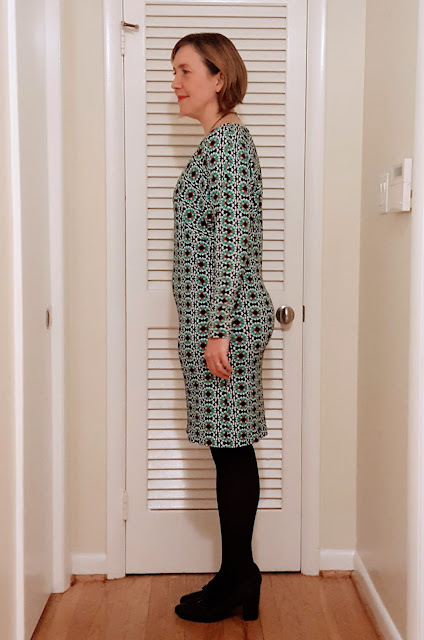 After sewing up the front, I placed on my dressmaker dummy to see how well the matching I attempted turned out. Not perfect, but looks nice enough on my headless twin. It was actually very easy to cut out and sew, but I did need to make sure of a couple of things. First I wanted to make sure that the lines of the florals at least matched up at the marked points, as much as possible. Though it wasn't perfect, you can barely tell if things don't match up exactly. With stripes that are more prominent, you definitely should take care with matching. This is what happens when you combine tired, a strong blur-inducing print, and an off match point. Ha. I ended up re-cutting and sewing the back again, and it was fine the second time. It didn't take very long to re-do, but it could be because I just wanted to be done already. LOL. Third, they want you to sew the neckline by hemming it! What? I always use facings or some kind of binding. Amazingly it worked, but I chose to fold down the neckline 5/8", pin it properly, and then hand sew it using this hem finish. 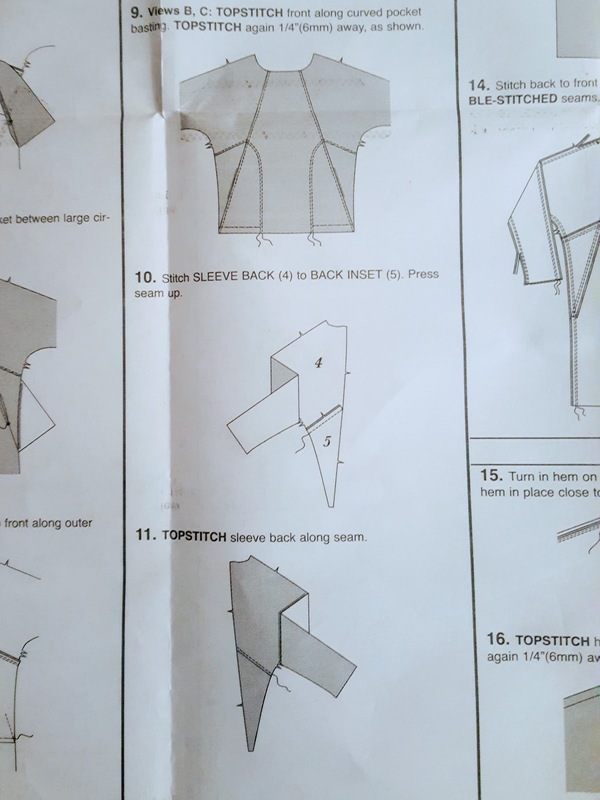 It looks great, but I can't decide if Butterick really knows this is the proper finish or were cutting corners by not including a binding or facing pattern piece. Hmm. The fit is okay. I chose to make a medium throughout. I am definitely a medium in the hip, but a small in the top, and I can tell it is roomy on me up top. 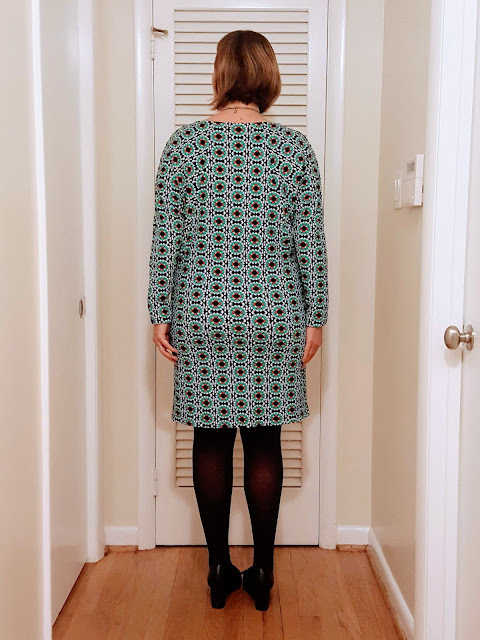 I think it looks fine, but I definitely have to wear a heel (or wedge) to add visual length to my body to make the silhouette less overwhelming for my frame. I do think this style would really suit those who are bigger on top and smaller on the bottom half. Even though it is not the ideal shape for me, I do LOVE this dress. It is so cozy and comfortable. The pockets are genius, and I really hope they make other patterns with a more fitted top with this feature. I would definitely make that. The pockets are really easy to sew up and look really nice. I am wearing it today to school, and I know I will be comfortable all day. 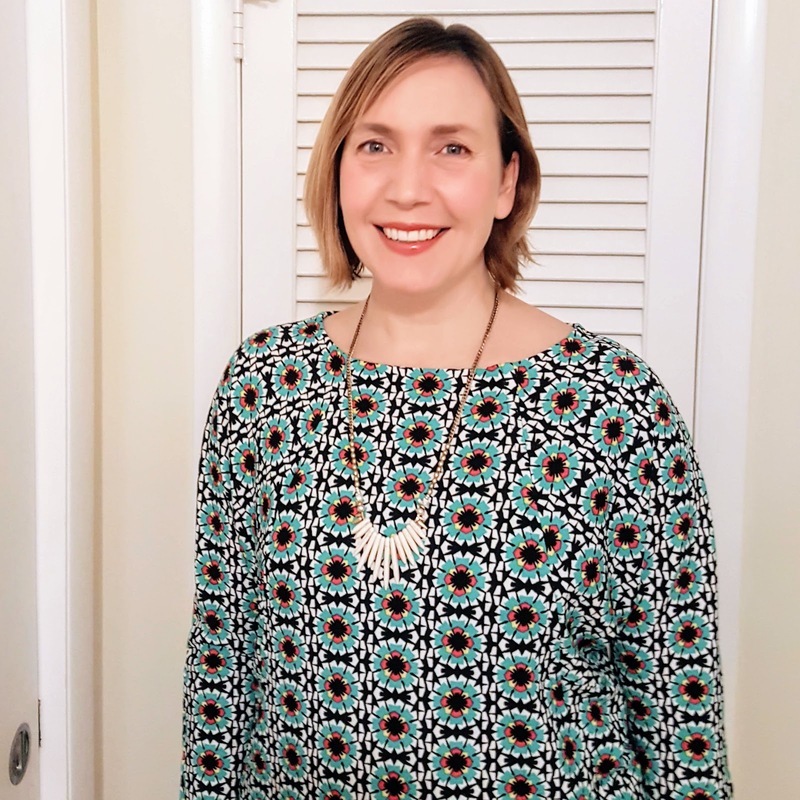 These dresses are in overabundance in my wardrobe, and with good reason. Have any of you made this pattern? Do any of you know of other cute dress patterns that suit double knits? I am always on a hunt for those! I hope all of you have a lovely week, and do look forward to chatting with you all about another make in a couple of months! Very nice work matching the print, I would not have attempted that pattern and fabric print together, but you made it look easy. 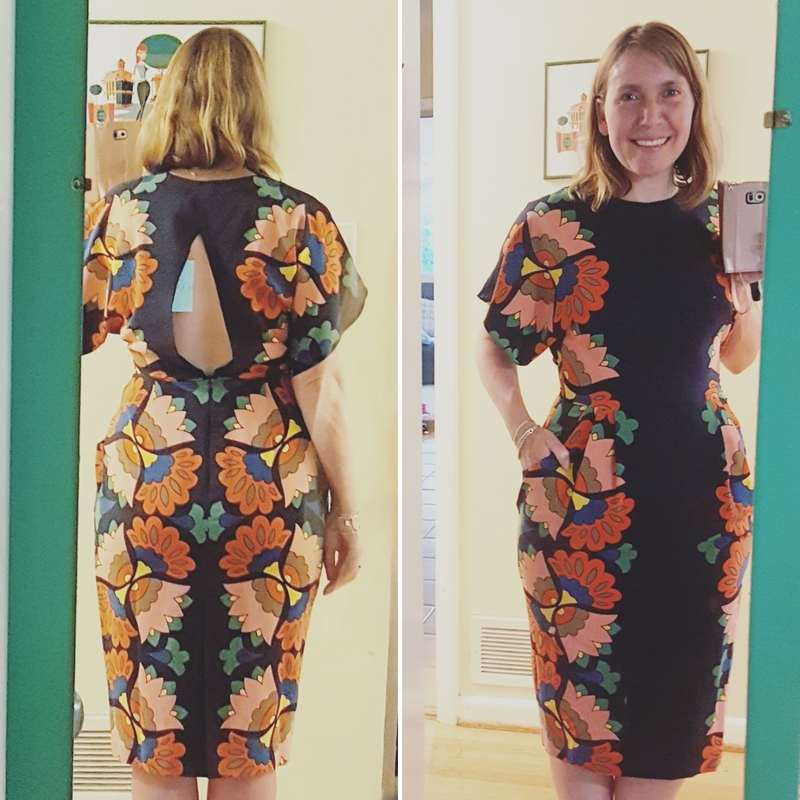 I too love double knit and am so-so on polyester, however, a good print will help me overcome any issues with the poly, and some are actually quite nice quality. I feel the same about scuba knits too. 100% wool doubleknit is a dream, and worth the price if you find it. It looks great! I really like the print with this design.